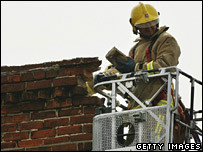 Homes in Kent have been damaged by an earthquake measuring 4.3 on the Richter scale. The BBC News website answers some of the questions surrounding the incident. Just how big was this earthquake? The British Geological Survey (BGS) had revised its estimates down from a magnitude of 4.7 to 4.3, with an epicentre 7.5 miles (12km) off the Dover coast. How far have the tremors been felt? The full extent of the fault area has still to be established but there are reports that the shock was felt in Essex, East Sussex and Suffolk. The BGS said the tremor could be weakly perceptible as far as London. What has been the extent of the damage caused? There are no reports of fatalities. One woman in her thirties was taken to hospital in Ashford, suffering from minor head injury and neck pain. EDF Energy has restored electricity to most of the several thousand homes left without power in the Folkestone and Dover area. Scottish and Southern Energy, which supplies gas to the area, is investigating 300 "possible gas escapes". Although most earthquakes occur at the boundaries of major crustal plates, they can occur, less frequently, within plates. The UK is on the British Eurasian plate. Senior seismologist Dr David Booth, of the BGS, said there were lots of faults running through the British Isles. In this case, north-west pressure on the UK caused a build-up of energy in these fault systems, he said, and this energy was released - causing the earthquake. Why would it have struck this area? The area does have underground faults which are occasionally activated and there does seem to be a large fault in this area, said Dr Booth. The UK is relatively aseismic but when the earthquakes do happen in this area they seem to be larger than average, added Dr Booth. Is this the first time Kent has been hit? No, and the BGS said the most recent earthquake "is by no means a complete surprise. There have been earthquakes in this location before. "Two of them have been some of the biggest earthquakes ever to affect Britain." The first was in 1382, and in 1580 a quake with a magnitude of about six killed two people in London. Kent also experienced smaller tremors in 1776 and 1950, which were in the "low fours". When was the last earthquake in Britain and how serious was it? Two small earthquakes - measuring 3.5 - were felt on Boxing Day 2006 by people in Dumfries and Galloway. On 23 September 2002, Dudley in the West Midlands was the epicentre of an earthquake with a magnitude of 5.0. There was minor structural damage as homes were shaken, but no reports of any injuries. How regularly is Britain hit by earthquakes? They are still a relatively rare phenomenon in Britain. The largest recorded one happened about 75 miles (120km) north-east of Great Yarmouth in the North Sea on 7 June, 1931 - it measured 6.1 and was felt across Britain, eastern Ireland and into Belgium, the Netherlands, and parts of Germany, France, Norway and Denmark. The largest one in more recent times measured 5.4 and happened at Nefyn, north Wales, in July 1984. Slightly less powerful - with a magnitude of 5.1 - was the one recorded at Bishop's Castle in Shropshire in April 1990. That was felt over an area of approximately 87,000 square miles (225,000 sq km). Is there a risk that the UK may one day suffer a major quake? No. The UK does not sit over a major fault zone, such as the transverse fault system in San Francisco, so there is no likelihood of a very large and damaging earthquake, said Dr Booth. There are a number of different scales. All are logarithmic because of the large range of earthquake energies. This means, for example, that an earthquake with a magnitude of six is 30 times larger in terms of energy than one with a magnitude of five. One of the largest ever, with a magnitude of 9.5, was in Chile in 1960. Four years later, there was another in Alaska, with a 9.2 magnitude.